Home Tags Posts tagged with "Armenia"
I’ve recently posted the last installment of my Azerbaijan Adventures, so it’s time to say farewell to the Caucasus (for the time being, at least), and look back at all I have distilled over the past three years. 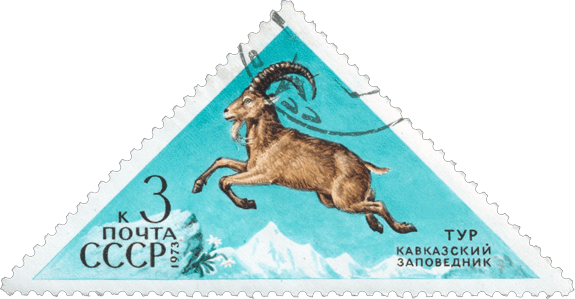 Like a goat jumping over the snowy peaks of the Caucasus, I have traveled through Georgia, Armenia, Azerbaijan and their respective renegade regions. In writing about my journeys, I intentionally left aside the most-traveled routes to focus on more extreme tourism, food, and cooking. I called them Adventures, although your humble main protagonists spent more time changing flat tires, dealing with hard-looking and/or corrupt customs officers, asking their way around in the middle of nowhere, and drinking local moonshine, than accomplishing any kind of crazy exploits. 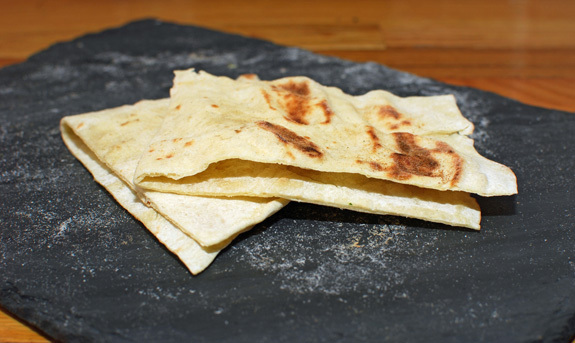 Zhingalov khats, a flatbread with a variety of fresh herbs, is a specialty from Nagorno-Karabakh (literally, it means bread with herbs in Armenian). If you ever visit the market in Stepanakert, you can taste the real deal made fresh in front of you. Unfortunately, that might be your only chance to do so: at the time of writing, my Internet and cookbook searches didn’t return a single recipe for zhingalov khats! To further complicate the matter, the name of the dish is transliterated in different ways, such as zhengyalov hac or jingalov hats. The flatbread is supposedly made with 7 fresh herbs (some other sources online said 8, 9, or 27), one or two of which are obligatory (which ones, we don’t know). The dough is rolled out, chopped herbs are placed on top, the sides are folded over and the whole thing is rolled out again before being cooked on a griddle. This link gathers most of the information one can find on zhingalov khats, including a rather funny video of a TV show broadcast on the Russian First TV channel. There are also some rare photographs from markets in Karabakh here, here, and here. But finally, my dear Caucasian foodies, the wait is over. I am proud to offer you what I would modestly call the first ever written recipe for zhingalov khats, an undeniable cornerstone in the little-known culinary heritage of Nagorno-Karabakh! It may not contain 27 or even 7 herbs, but it’s pretty good all the same. In fact, the tighter flavor profile will even help one recognize what’s in it, which is a big plus in my opinion. It also doesn’t follow the absurd diet restrictions that go with fasting for lent, and this makes it even tastier. Butter makes everything tastier, and nobody should tell you when to eat it and when not to. The dough is identical to a lavash dough, the main difference being that it needs to be cooked longer. 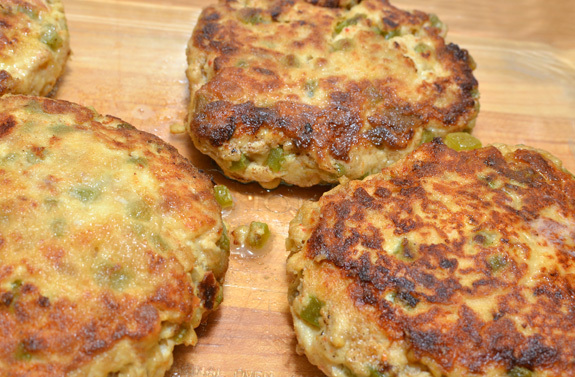 You can enjoy your zhingalov khats as a hot snack with a little bit of butter, or serve them with kebabs. In a cup, mix the water with the honey and yeast, and let rest for 10 minutes. Transfer to the bowl of an electric mixer fit with the paddle attachment, add about 3/4 of the flour, and mix on low speed for 1 minute. Add the rest of the flour and the salt, switch to the dough hook attachment, and knead for 5 minutes. Cover the bowl with plastic wrap, then let rise in a warm place until doubled in volume, for about 3 hours. Punch down the dough and let rest for another 10 minutes. In a small saucepan, cook the leeks and scallions in butter over medium heat until soft. Remove from the heat, let cool, then mix in the parsley. 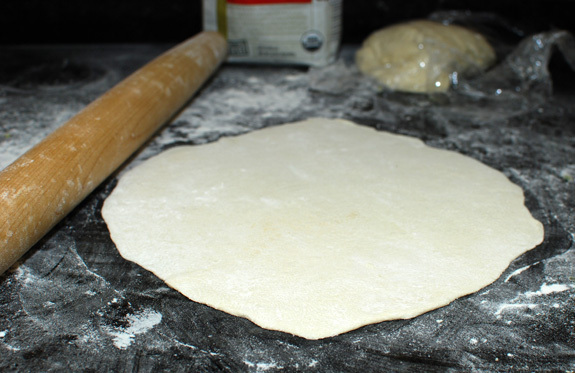 Divide the dough into 4 equal pieces, and roll into 10″ x 12″ ovals using a rolling pin. Don’t forget to flour your work surface generously as you go, giving quarter turns to your dough between each roll. Spread the leek, scallion and parsley mixture evenly over the breads, fold over the sides, and roll out again to the same size, adding flour as necessary. Turn a wok upside down on a gas burner, and heat on the highest setting for a few minutes. Rub the wok with a paper towel soaked with olive oil, and place a flatbread on the wok. Flip several times, about every minute, until cooked through and nicely browned. Remove from heat and eat immediately. If you have to wait, cover with a towel, and spray with a bit of water before reheating. 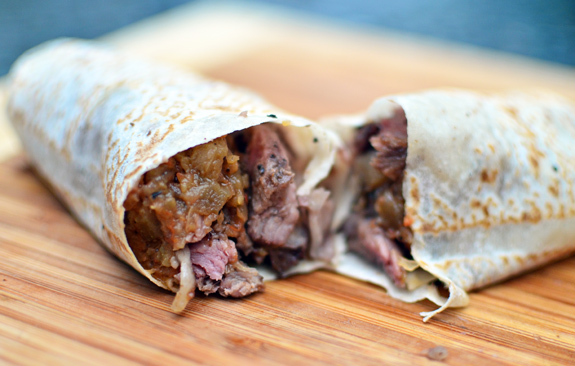 Lavash is a large flatbread popular in both Armenia and Azerbaijan, where it’s commonly used to wrap food like kebabs. The etymology of the word is unclear, and various scholars alternately mention an Armenian, Turkic or Persian origin. 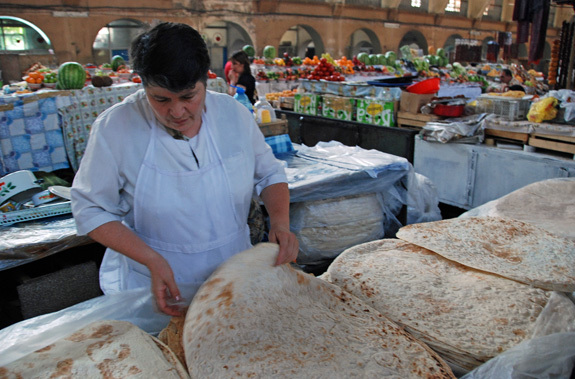 The picture above shows the lavash stacks at the market in Yerevan. 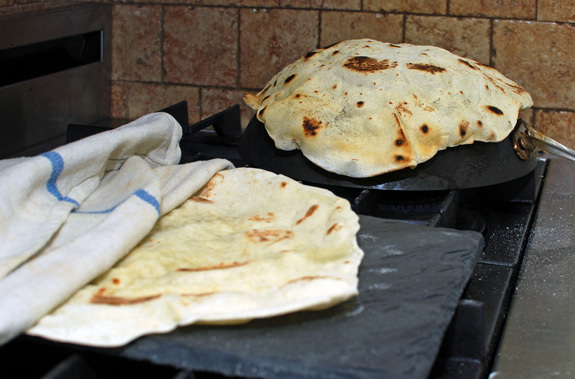 These breads are quite large, but you don’t need to invest in a Guiness-Book-worthy griddle to make excellent lavash. The authors of Flatbreads & Flavors, a rather original book from which my recipe below is adapted, recommend using a wok turned upside down. This method produces delicious flatbreads of about 12″ in diameter. If you really want a paper-thin result, you can use a pasta machine instead of a rolling pin — the lavash won’t be any less good if it’s rectangular rather than oval! Divide into 4 equal pieces, and roll into 10″ x 12″ ovals using a rolling pin (or into thinner rectangles using a pasta machine). Don’t forget to flour your work surface generously as you go, giving quarter turns to your dough between each roll. Turn a wok upside down on a gas burner, and heat on the highest setting for a few minutes. Rub the wok with a paper towel soaked with olive oil, and place a lavash on the wok. Flip several times, every 30 to 45 seconds, until nice brown blisters start to form. Remove from heat and eat immediately — nothing beats freshly baked bread. If you have to wait, cover with a towel, and spray with a bit of water before reheating. This recipe is the first of my own interpretations of the mythical “Lake Sevan Gifts” that I talked about in my last Armenian Adventures post. It was the perfect thing to do with the trout I just caught on Cayuga Lake! 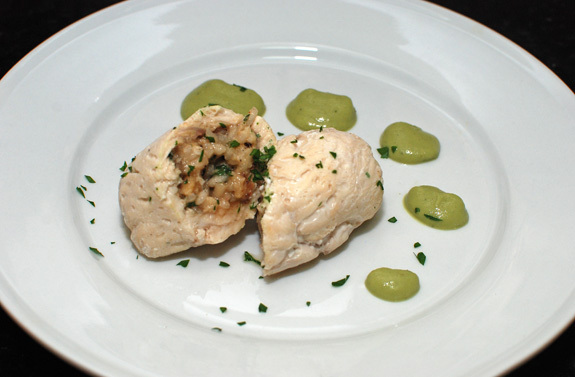 My version uses pounded fillets instead of the whole fish, making it more akin to a paupiette. The stuffing is very close to the one described in Pokhlebkin’s Cookbook of the Soviet Peoples, except I prepare the rice like a risotto. I served the kutap with a zucchini and basil purée. In a small saucepan over medium heat, cook the rice and raisins in the butter for 1 minute. Add the ginger, salt, pepper and white wine, and boil gently until almost dry. Add half of the chicken stock and simmer until fully absorbed, then repeat with the rest of the stock. Remove from heat and let cool. Take off 3 oz of flesh from the fillets and reserve. You can either use the tail ends if the fillets are small, or cut off the thickest part if they’re larger. Place the fillets between sheets of plastic wrap and lightly flatten using a meat pounder. You want to obtain four 4″ x 6″ rectangles, 1/4″ thick — approximately, this is not a math class. 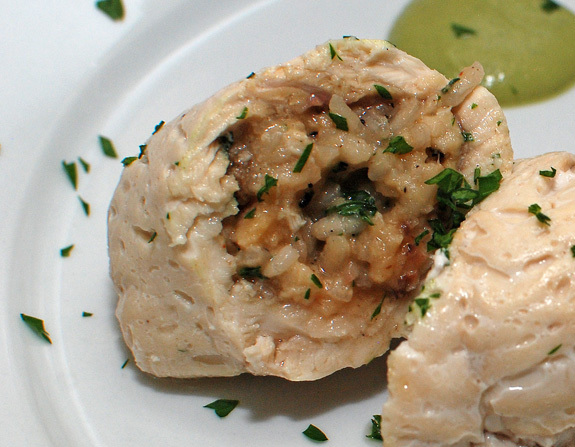 Chop the reserved flesh into small dice, and add along with the parsley into the rice mixture, then divide between the four rectangles and roll into cylinders. Tightly wrap the cylinders in plastic film, making sure that the stuffing is tucked in (this happens almost naturally). Steam the fish for 5 minutes, let rest for 1 minute, then remove the plastic wrap. Cut each portion on a bias and serve. 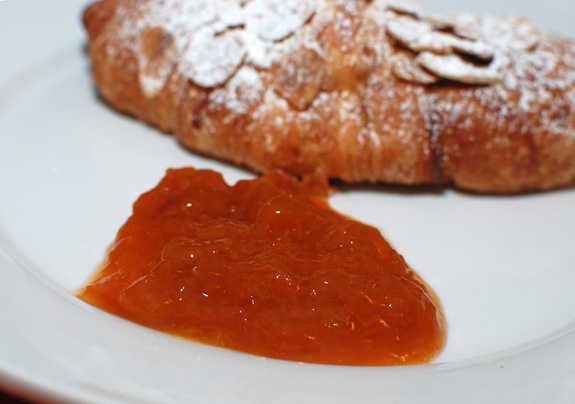 Related to my recent trip to Armenia, here’s a recipe for apricot preserves with a Caucasian twist. 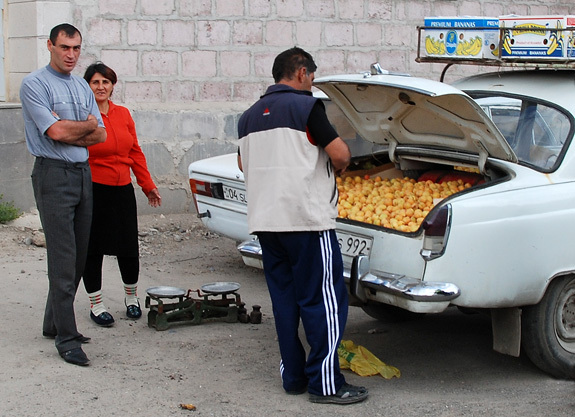 As you can see from the picture above, apricots are plentiful in Armenia. Why not combine them with some local brandy and honey? Young Armenian brandies may lack the subtlety to be enjoyed as digestifs, but they offer a robust flavor that can stand the heat of cooking applications. I’ve already mentioned the famous Yerevan Brandy Company here, and their 5-star (which means 5-year old) Ararat brandy is perfect for the kitchen — you can even find it in some U.S. liquor stores. For the honey, choose something light and mild, such as acacia honey. This recipe is adapted from the Ball Complete Book of Home Preserving, which covers all the aspects of canning in over 400 recipes. 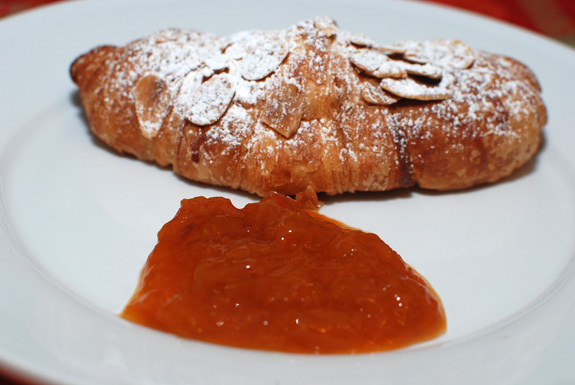 Try the preserves with an almond croissant! Toss the apricots, sugar, honey and lemon juice in a saucepan, and let rest for 45 minutes. Bring the mixture to a boil over medium heat, then gently boil for 25 minutes, stirring regularly. Mix the pectin with the brandy, add to the saucepan, and boil for 3 minutes. Skim off the foam and let cool for 5 minutes. Transfer to a sterilized pint jar, seal and process in a 200 F water bath for 15 minutes.